One of the many pitfalls of downloading music illegally is that sometimes you download an incomplete rare album and you’re unable to find the missing tracks to make the album complete. Usually I’ll just delete and discard. But this compilation is somehow connected to my mind in some sort of mystical way. You see, it has been my wish for a very long time, that in the event of ever finding out I have a terminal illness and a short period of life remaining, that I obtain some LSD and trip to the other etheric plains. This album, it seems, will be one of the albums that play during this trip session. 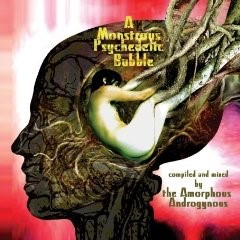 A curious compilation of all manner of Psychedelia tunes mixed by Amorphous Androgynous. If you’re planning on dropping some acid soon, I suggest this is what you want to have on in the background. Unless of course if, to you, dropping acid means a chemical spill in the lab. You might not want this on when the HSE come to visit.